What Do Your Cats Love About Your House? 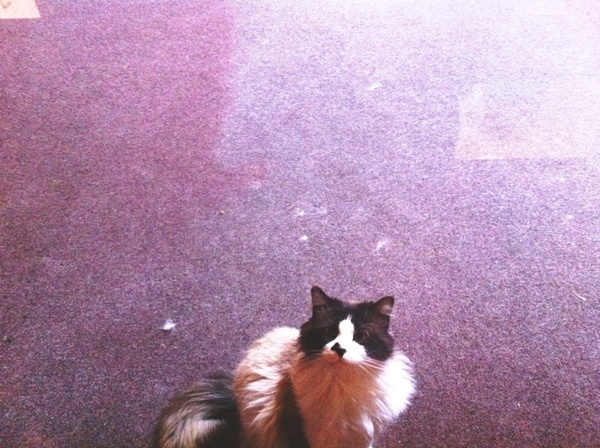 My cats are the luckiest in the world -- we've moved into a house built to entertain cats. Years ago, I purchased and read The Cats’ House by Bob Walker and Frances Mooney, a couple in San Diego. They had designed the most amazing cat house to give their cats a very rich indoor life. There were walkways high up on the ceiling, tiny stairs that ran the length of a wall, and wonderful little holes in the wall (mouse-shaped) that the cats could run through. The couple had carpentry skills and a real artistic flair. The rooms were colorful and neat and beautiful, and the cats looked like they were having a great time. I’ve been thinking a lot about that book lately, because we have lucked into such a cat house. The house was not intentionally designed for cats to have fun, but there are things here that remind me of the San Diego cat house. I’ve often wished I had more visual flair; I’ve often wished I had better carpentry skills. Maybe I’ve been given a huge gift! The man who lived here before us had two cats; and I remember seeing a poster on the wall when we first looked at the place that said something to the effect of “Love me, love my cats.” As a bonus, we discovered that two of the interior doors had cat doors installed. They’re not in use yet. We taped them up temporarily because Zorro, our rescued stray/feral, is behind one door, and he hasn’t been introduced to the others yet. The other door from mudroom to kitchen just hasn’t been closed yet. But now that it’s getting warmer, I’ll shut the door, and see if the cats can learn to use the cat door. Any suggestions on how to teach the cats to use their door? 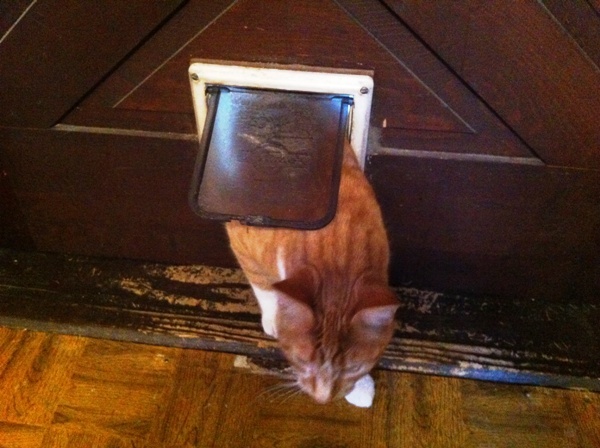 Do treats or a toy on a string dragged through the cat door help the cat get the idea? Okay, this is probably more common. We had this in our last place. There’s a great runway over the tops of the kitchen cabinets. 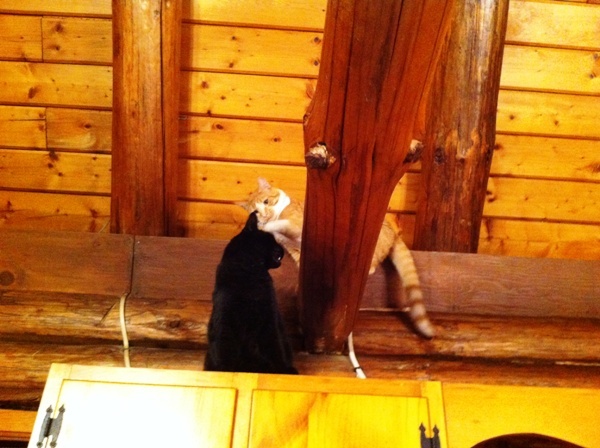 The cats love to run around up there. But what’s really cool about this arrangement is that the kitchen cabinets lead to other cool things. This is a log house, and there are three log beams that run across the living room/kitchen area. The cats fearlessly took to these, and they walk and run across them like a balance beam. Fortunately, the logs are wide enough that it seems to be no problem for any cat. I don’t think anyone has fallen yet. When we first saw the place, I wondered and worried about whether I’d have to keep the cats off the beams, and how was I going to do that. Silly me. I never had a chance to figure it out. We’ve seen some interesting encounters on these beams. Sometimes one cat will chase another. I’ll say this — in this new place, all the cats are getting a lot more exercise, between the stairs, the balance beams, the cabinets, the windowsills and the loft. 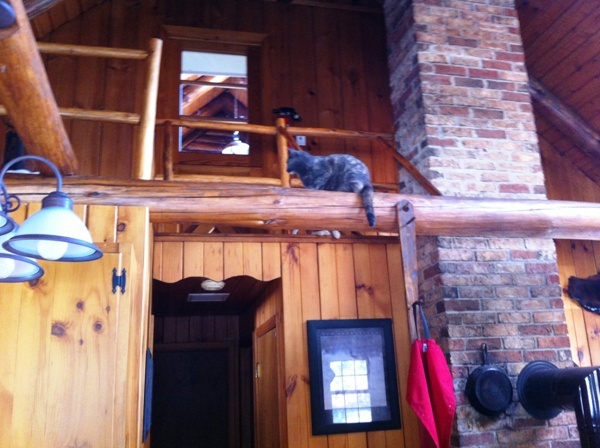 The cats adore the second-floor landing, where they can survey the kingdom from above. 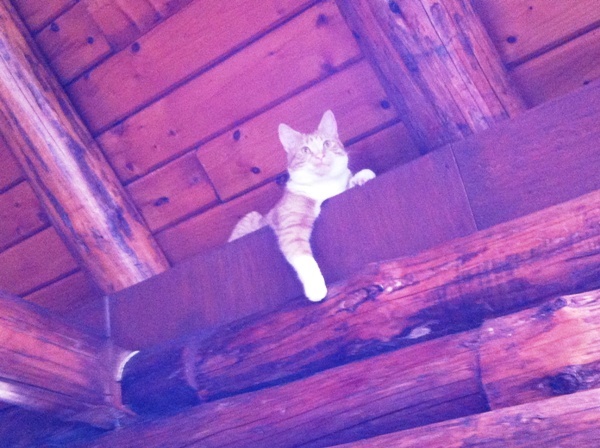 It’s warm there and quiet, and has easy access to the cabinets and the balance beams. What could be better? We have a neat little laundry chute in the bathroom. It looks like a bench, and it has a lid that opens and a narrow chute where you can throw laundry down below. I’m going to make sure no cat ever sees that chute. Thankfully, the lid doesn’t stay open. And seriously, the cats are having too much fun checking everything else out. I didn’t set out to live in a cat house, but it seems that I’ve landed into one. The universe works in strange and interesting ways! It just proves that sometimes, what you need is right there in front of you. 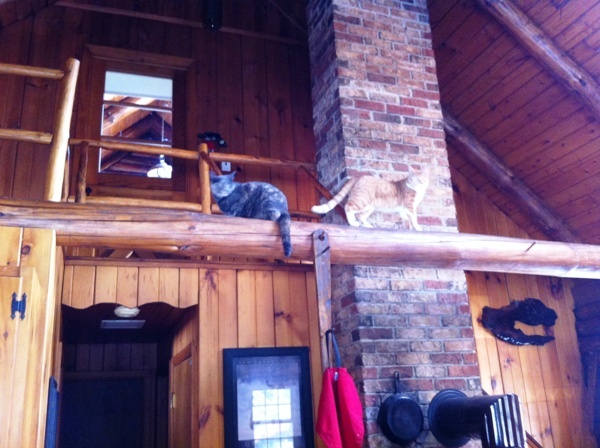 Does your living space provide cool opportunities for your cats, intentional or not? What do your cats love about your house? Share your thoughts in the comments!